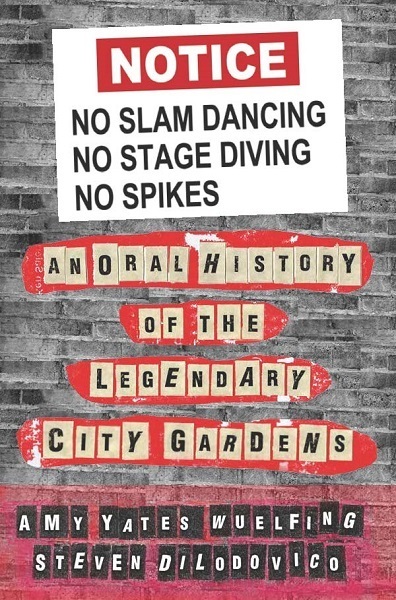 Fresh from her appearance on Comedy Central’s The Daily Show with Jon Stewart, music journalist and author Amy Yates Wuelfing sat down with little old me, of all people, to talk about her new book No Slam Dancing, No Stage Diving, No Spikes: An Oral History of the Legendary City Gardens. What was she thinking? 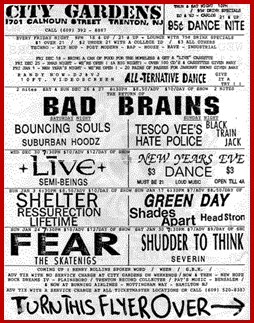 For the unfamiliar, City Gardens was among the country’s most notorious punk rock clubs of the 1980s and ‘90s, and everyone from the Ramones to the Dead Kennedys to Green Day graced (?) its rickety stage. The stories told in this book are quite literally insane, the mayhem on stage frequently surpassed by the lunacy playing out on the dance floor and in the parking lot. It’s a must-read for music lovers, psychology majors, and people dangerously obsessed with fire. 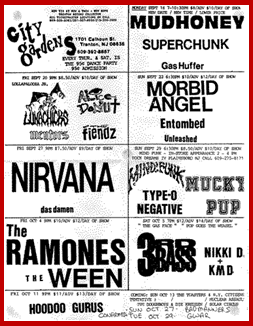 EJB: Why write a book about a punk-rock club in New Jersey? Amy Yates Wuelfing: City Gardens was in the middle of nowhere. Not Philly, not New York, but it was still a big club. That fact that it was so close, and in the middle this dead zone, made the community of people who went there stronger and tighter. It was almost like college, you saw the same people all the time so they became your friends. That was the main thing for me. And unlike the clubs in Philly or New York, the pretentious element wasn’t really there. EJB: People will be shocked by some of the stories recounted in the book. What are some of your favorites? to is the riot at an Exploited show. Some people say that the band’s van was completely ransacked and set on fire, other people say, no, just a broken window or two. Which is correct? You have to decide. There is a similar story about the one time the Beastie Boys played there. Was it the best show ever – or the worst show ever? That’s why I love oral histories so much; you get every side. EJB: You talked to members of The Ramones, Green Day, Dead Kennedys, Black Flag, and other big punk acts as well as plenty of pop, metal, and rock bands from the era. How receptive were these musicians to being interviewed? Did anybody give you a hard time? Amy Yates Wuelfing: No one gave us a hard time, but some people just didn’t take part in the project and that’s fine. In the end, the book turned out exactly like it was supposed to. Anyone who passed on talking to us isn’t missed. EJB: You told me a lot of publishers were iffy on your plan to interview “normal” people (as if City Gardens’ patrons could be qualified as normal) along with the bands, believing readers wouldn’t care what they had to say. However, I found that to be the most fascinating aspect of the book. I’m convinced a sociology course on disaffected youth could be built around this thing. What it your plan all along to paint that kind of picture, or did the theme and direction of the book evolve as you compiled and transcribed the interviews? Amy Yates Wuelfing: The book started out as a project to write the memoirs of City Gardens promoter Randy Now, then it just kept expanding in scope. Early on, I realized that the club was so important to so many people, that I felt it was essential to include those viewpoints as well. The normal, not-famous people had great stories. And you are not the first person to recognize the sociology angle! It is a total case study in how misfits found each other before the internet. As we began interviewing people, it all just came together. The book became what it was meant to be, not to get too “new age” on you. The book had a force of its own. EJB: This title is selling out all over the place. Someone stole mine before I could resell it on eBay for a profit! Amy Yates Wuelfing: Dude, that’s so punk rock. Where can people get a copy? Amy Yates Wuelfing: The first pressing, which was 2000 books, sold out in less than a month. If anyone had told me this a month ago, I would have laughed and bought them a drink. We are doing a second pressing right now. To get a copy of the book, head to infinitemerch.com. They are the first people we will restock with books when they come in, mainly because they are really close to my house, which is where the books will be delivered. This whole thing is DIY, just like the old days. No publisher wanted to touch this, so we have to do the grunt work, but we don’t mind. The book was a labor of love and to it see it get this much attention makes me so happy. At every signing we do, people thank [co-author] Steve and I for putting it together. That alone makes it worth the time and effort. It’s certainly not a book genre. It has few fans, and it’s not a topic we typically seek out in our reading choices. We seldom want to think about it. Yet it is inevitably our common experience, regardless of where or when we live or whether we are kings or peasants (or if we talk, bark, or meow). If you’re reading this, you’re still walking the Earth (go you! 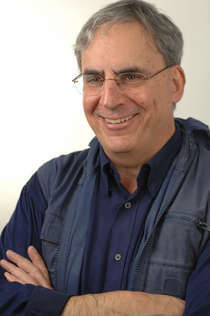 ), but you have probably shared in the death of someone you care about or are facing such an unavoidable future event. If you yearn to make peace with that, or just be enlightened, you have to read The Ultimate Wonder: World Stories Illuminating Death by Skywalker Storyteller, an uplifting and unique collection of stories from around the world that show how the people of various cultures have faced and learned to accept life’s last great mystery. I’ve been a fan of Skywalker Storyteller (a.k.a Skywalker Payne) since I first stumbled into her blog a few years ago and began reading her essays, poems, and stories. In addition to being a gifted writer, she is as original and fascinating a character as you’ll ever come across. I’ll let you discover for yourself as you read the brief interview and learn about her and her work in the YouTube videos posted below. 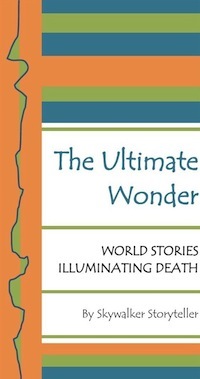 EJB: Tell us about the concept of The Ultimate Wonder: World Stories Illuminating Death. Skywalker: I wanted to share a selection of stories I told a few years ago on my storytelling website. I feel that they can help people face and accept this one, last experience of life we all share. EJB: Describe the spiritual journey that led you to write this book. Skywalker: It really wasn’t so much a spiritual journey as a storytelling journey. 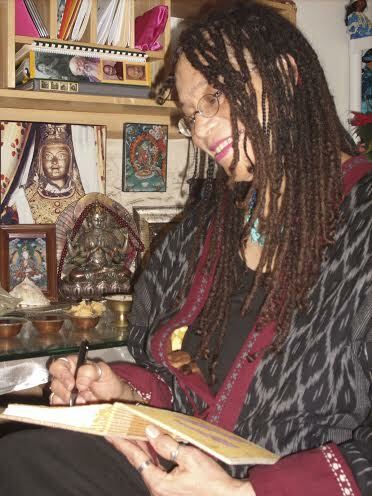 But, I do practice Tibetan Buddhism and my practice influenced me to begin the podcasts and write the book. I have a YouTube Three Minute story – My Journey to the Ultimate Wonder [see below] that explains a little more. EJB: How did you go about collecting, adapting, and sorting the tales for this collection? Beyond the unifying theme of death, they’re quite diverse and illuminating in different ways. Skywalker: When I began the podcasts, I first found stories I had told on the theme of death and then chose some, particularly the African ones, that I had wanted to tell for some time. And yes, as you noted, death is the unifying theme, but I was able to find different themes within that and then group stories around larger ideas, such as “Death is a Nurturing Woman” and “Resurrection.” All of these stories have been retold by me, and for many, I found more than one version. Also, for all, I gave characters names, researching names within the cultures that the stories originated. I also include a couple of original tales. EJB: The framing device for the stories in this book—that of the storyteller before an audience—is interesting and unusual. I know you have been a professional storyteller in the past. How much of that character is based on you and your experiences? Skywalker: Well, I’m still a storyteller and I am the storyteller in the book. I wanted to give readers as much of a storytelling experience as I could in a written form. EJB: Who do you think should read this book and what do you hope they gain from it? Skywalker: I actually think people of all ages will enjoy reading The Ultimate Wonder. It is arranged in such a way that people can pick and choose the stories that interest them. It’s a book that is perfect for families—as older members can select stories for children and then those children can later return to find new stories to read. What I trust readers will gain is a new view of the end of physical existence, that they will be able to share my understanding of life’s last great adventure as the ultimate wonder. The Ultimate Wonder: World Stories Illuminating Death is available on Skywalker’s website (follow the links there to your favorite bookseller). Greetings readers and fellow writers. I have an awesome treat for you today! Peter Benjaminson, author of several books about the famed Motown record label and its artists, was gracious enough to sit down with me for a few minutes this weekend to discuss his newest biography, Mary Wells: The Tumultuous Life of Motown’s First Superstar (Chicago Review Press). For the uninitiated, Mary Wells was not the first Motown act to score a number one hit (that honor belongs to The Marvelettes and Please Mr. Postman), but she was the first solo artist to become a recognizable star for the label, thanks to a smash hit song that, nearly five decades later, is still beloved the world over: My Guy. She also toured with The Beatles (!) in 1964 and influenced a generation of singers. But instead of joining the ranks of Motown legends such as Diana Ross and Stevie Wonder, Mary’s life took a different turn. Several, in fact. And Peter Benjaminson’s book is by far the most in-depth chronicle of those events ever written. EJB: Thank you, Mr. Benjaminson, for taking the time to talk about your latest book with us. What inspired you to tell the story of Mary Wells, Motown’s first solo star? Peter Benjaminson: I was working as a reporter for the Detroit Free Press when Woodward and Bernstein used what they called “investigative reporting” to topple President Nixon. A fellow reporter named David Anderson and I went to the library to look up a book on investigative reporting so that we could learn about that kind of reporting. When we found out that no book had ever been written on the subject a light bulb ignited over our heads because we were actually doing that kind of reporting and figured we could write the book ourselves. So we wrote it – it was titled, believe it or not, Investigative Reporting — and was the first and best how-to in the field. It went through two publishers and two editions and stayed in print for 20 years. This convinced me that book writing was for me. Since I was in Detroit, I thought of writing about the auto industry, but that had been done already by numerous other writers. Then one day when I was sitting in the City Room waiting for an assignment, an editor told me he had heard that Flo Ballard, formerly of the Supremes, was on welfare. I roared over to her house, interviewed her, and wrote a story about her being on welfare, which was the equivalent of writing in the Washington Post today that Joe Biden is on food stamps. Flo was pleased by the sympathetic reaction to her story and invited me back to visit her on evenings and weekends after work to record her life story as told by her. But when I tried to sell the book idea to Grove Press in New York, they pointed out (this was in 1977) that no book had ever been written in this country about Motown itself. So a bright light went on over my head and I filled that gap by writing The Story of Motown, which Grove Press published in 1979. I kept trying to sell the Flo Ballard book idea, but I was unable to do it until – gulp – 2006 – the year that the “Dreamgirls” movie came out and convinced movie makers and book publishers that there was money to be made in the Supremes story. I then sold the Ballard book idea to Chicago Review Press, which published it in 2008 as The Lost Supreme: The Life of Dreamgirl Florence Ballard. Then a guy named Randy Russi called me from Florida and told me he was a friend of Mary Wells (Mary had lived near him in Florida for a time). He suggested I write a book about Mary. I got peeved at him because I thought Mary’s story would be a replay of Flo’s story with the names changed, but he convinced me there were 100 or so reasons why Mary’s story was more interesting than Flo’s. Because The Lost Supreme had done so well, it was easy to convince Chicago Review Press to publish Mary’s story and they recently published the book we’re talking about, Mary Wells: The Tumultuous Life of Motown’s First Superstar. 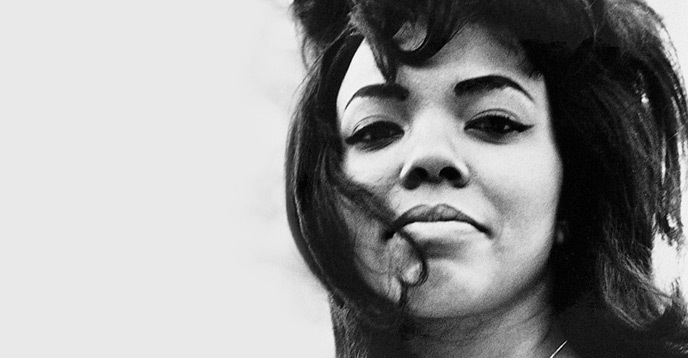 EJB: What do you think would surprise people the most about Mary Wells? Peter Benjaminson: Some, but not all of her fans will be surprised to learn that, a), she married two brothers, one after the other (Cecil and then Curtis Womack, although her marriage to Curtis was common-law) and had children with both of them, and, b), that she had a fairly good musical career, including a No. 1 hit, Gigolo, after leaving Motown. EJB: This is the second biography you have written about a Motown star who died young, the first being The Lost Supreme, about Diana Ross’s fellow Supreme Florence Ballard. Tragic figures make for fascinating subjects, of course, but what is it about the Motown era that intrigues you so? Peter Benjaminson: It’s not just me. I don’t believe there’s another record company anywhere about which more than two or three books have been written. More than 180 books have been written about Motown, with mine being the most recent. That’s because Motown succeeded in closing the gap between white and black music in America, something that no other company was able to do and that will never happen again. EJB: What’s next for Peter Benjaminson? Do you have any more Motown artist biographies in the works? How about one on Gladys Horton? Marvin Gaye? Tammi Terrell? I can guarantee you at least one reader! Peter Benjaminson: Thanks for guaranteeing me at least one reader. I would hesitate to write a book on Marvin Gaye or Tammi Terrell because other authors have already done so. I admit I was the third author to write a book on Flo Ballard, but I had one thing that the previous authors did not: an eight-hour revelatory interview of Flo audio-taped the year before she died that had never been previously publicized or released. There’s no book on Gladys Horton I know of but she has fewer fans than Marvin Gaye, Tammi Terrell, Flo Ballard, or Mary Wells, which would make a proposed book a very difficult sell to publishers and readers. What I am working on is books on two people who had millions and millions of fans: Rick James and Farrah Fawcett. James was Motown’s final superstar, sold literally millions of records and was a popular character on TV, sometimes playing himself, as late as 2004, which was also the year of his death. Farrah, a major TV, stage and movie star who died the same day that Michael Jackson died in 2009, changed the hairstyles of many American women, struggled to improve as an actress throughout her life, and was nominated for a posthumous Emmy for producing a movie about her own death. She also appeared on the cover of People Magazine some 14 times. Neither has been the subject of a serious biography. In book publishing terms, writing about either person wouldn’t be too much of a stretch for me: James would be the third Motown star I’ve written about, as well as the fourth book I’ve written on Motown, and Fawcett would be the third female entertainer whose biography I’ve written. EJB: Any quick tips for non-fiction writers looking to break into music journalism? Peter Benjaminson: They should take heed of the greatest advice ever offered to a music journalist: “Writing about music is like dancing about architecture.” The saying originates with Nietzsche but has been stated more recently by others. 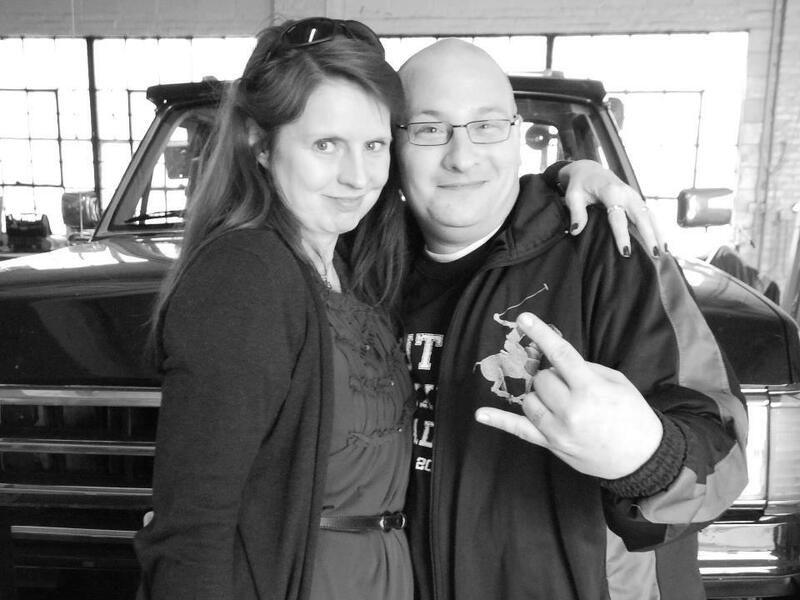 EJB: Thanks so much, Peter, and good luck with your latest projects. 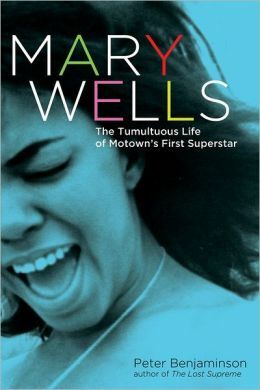 Mary Wells: The Tumultuous Life of Motown’s First Superstar is available on amazon.com, barnesandnoble.com, and at any bookstore with good taste. I also urge you to check out The Lost Supreme, Peter’s biography of Florence Ballard. It’s a vivid portrait of a talented singer who met a tragic end. What is the “point” of blogging? Dating Advice vs. Writing Advice: Which is worse for your self-esteem?